I went into this pretty blind aside from having heard that it counts as gothic and that it was apparently a kind of satire of gothic novels of the late 18th century. I'll definitely second calling it a gothic satire. I'd say its only real fault was was taking the satire a bit too far sometimes and the subsequent authorial digressions (which were part of the satire, I'm pretty sure). Basically, it got a bit silly at times, but it did make me laugh out loud once or twice, and it was a lot of fun. It's the tale of how Catherine Morland goes off on her own (well, with friends but away from her family) for the first time at seventeen to Bath after having lived a retired kind of life in the country, and some of her experiences there and at Northanger Abbey, where she gets invited. Austen has Catherine acting quite silly at times in acting out her role of gothic heroine, but it was quite fun to read of her glee at reading the gothic novels of her day and how they influenced her imagination. I read this for the "Gothic" square for Halloween Bingo. I don't think it would fit any of the other squares, really, unless you tried to count it for "Terrifying Women". 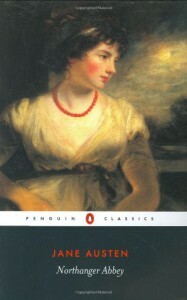 I am tempted to try out The Complete Northanger Horrid Novel Collection, though, out of curiosity.